Plumerias are a very popular plant because of their sweet smelling colorful flowers and attractive form. In Hawaii, the plumeria has become part of the culture and is used to make the lei necklaces used in celebrations. Although they are thought of as tropical, plumerias can handle a subtropical climate because they go dormant, shedding their leaves, when the weather gets cool. They can tolerate temperatures down to freezing and possibly a little cooler for very short periods of time. Given a good microclimate, plumerias do very well in Phoenix. In addition to the information given on this page, specific condensed instructions for caring for potted plumerias in Phoenix can be found here Potted Plumerias. Plumerias are a member of the Apocynaceae (Dogbane family). They are divided into two main groups, the Plumeria obtusa and Plumeria rubra. Obtusa plumerias are considered to be evergreen and have rounded shiny leaves that are dark green in color while the rubras are decidous,(lose their leaves in winter), and they have duller green pointed leaves. Obtusa plumeria generally produce white flowers while rubra have colorful range of flowers. Rubra plumerias are more hardy and heat tolerant than obtusa and are therefore a better fit for outdoors in Phoenix with its temperature extremes. The plumeria on the left is a rubra named Penang Peach and has an amazing coco butter/cinnamon scent. Plumerias generally start to flower in late spring and continue to flower all summer holding their flowers in bouquets at the end of their stems. Obtusa plumerias will sun burn in the Arizona summer when subjected to full sun, so at the least they should be placed where they will receive afternoon shade. The ideal condition for an obtusa plumeria in Phoenix is filtered sun, such as under a tree with a light canopy. In filtered sun it will get enough sun to bloom but will not be over exposed. Rubra plumerias are much more heat tolerant than Obtusas. In fact, they can take full Phoenix summer sun. Their leaves tend to burn some during the hottest driest months but no more than plants such as citrus which are typical full sun plants here. The flowers do not take the heat as well as the leaves and for this reason a rubra will be more attractive if it gets afternoon shade. 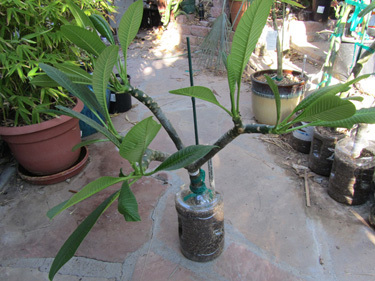 If moving a plumeria from shade to sun be sure to do so gradually. Like all plants, plumerias will burn if suddenly moved from a low light to a high light environment. Plumerias go dormant when night time temperatures go below 50 degrees. Usually they will shed their leaves when going dormant but sometimes they will just stop growing. Rubras lose their leaves more easily than obtusas do, resulting in rubras being more cold hardy. Many references state that Plumerias cannot take temperatures below 40 degrees F. Through experience, We have found this not to be the case under certain conditions. In fact, We have a rubra in my back yard, planted in the ground, that was subjected to temperatures as low as 33 degrees for a brief period of time without damage. The key is the duration of the frost. Prolonged periods at these temperatures will do damage especially with young plants. Dig a hole at least twice the size of the rootball. At a minimum, make the hole 2 feet in diameter and 2 feet deep. Back fill the whole with the same native soil that was removed. It also is a good idea to finish with the hole an inch or two recessed so that a watering basin is formed. After planting, spread a thin layer of compost on top of the soil to help conserve moisture and to supply some nutrients. Do not fertilize the newly planted tree until it has been vigorously growing for a couple of months. Plumerias tend to have a flimsy foundation of roots when they are young, especially if they are grown from a cutting, so it is good to tie them to a strong wooden stake when planting. Plumerias are trees, so they should be planted in the largest pot that can be safely moved around. A light porous soil is best because it will allow water to flow through and out of the base, which helps to reduce the accumulation of salts present in Phoenix water. A stake should be used to prop up the plant until its roots have sufficiently anchored it. This usually takes about a year. Most plumerias are grown from cuttings and have flimsy anchorage until they are well established. 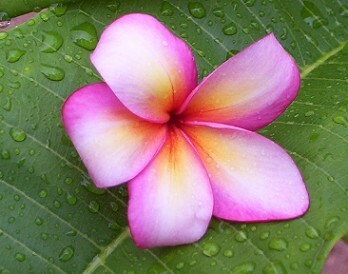 Plumerias can be grown on either a citrus watering schedule or a grass watering schedule. However, they are generally more healthy on a citrus schedule so a grass schedule should only be used if there is no other choice. On the grass schedule it is recommended that they not be grown actually in the grass, because being surrounded by thatch will keep them too moist and will most likely result in root rot. Plants in pots always need more watering than those in the ground. In the summer, a plumeria's big leaves will facilitate a lot of evaporation so it will need to be watered at least twice a week, if not more often. In the winter, a dormant plant should be kept fairly dry. A 100% dormant plant can probably be watered once a month, while a plant that hasn't lost all its leaves but is not really growing can be watered about every two weeks. If the pot is outside, the plant can just be watered until water starts pouring out the bottom. Obviously in the house this would make a mess, so the plant can be watered until water starts to come through into the saucer. However, if the plant is always kept in the house it is recommended to flush water through the pot every now and then to reduce salt build up. Plumerias grow rapidly and are therefore heavy feeders. During the growing season, a plumeria can be fertilized every one to two months using a high phosphate water soluble fertilizer. They should not be fertilized during the cool time of the year when they are dormant or nearly dormant. I currently use a combination of fish emulsion 0-10-10 and 5-1-1 to fertilize my plumerias. Plumerias can be pruned to promote a desired shape. However, they tend to branch less vigorously than your average plant, so it is difficult to truly shape them. The good thing about their lack of branching is that it results in thick branches and a fairly open canopy which is part of what makes them look exotic. If one attempts to shape a Plumeria, they should keep in mind that branching habits are dependent on the cultivar. For example, a Singapore Obtusa can be more easily trained into a compact form than most Rubras. This makes the Obtusa a better potted plant. All types of Plumeria will branch at flowering points. Usually this results in three branches. This is especially useful information for those new to plumeria growing who are watching their new cutting go straight for the ceiling as one slender stick. The temptation is to pinch the end to promote branching. However, pinching the end in this case will inhibit the emergence of flowers and possibly reduce branching overall. In fact, if the Plumeria being pinched is a variety that likes to sprawl it will often just try to send out a single new branch to continue in the direction it was growing before it was pinched. This behavior defeats the purpose for pinching it, and can result in an uglier plant rather than the increase in attractiveness desired. One can save themselves some frustration by researching what kind of growth characteristics a plant has before purchasing it. 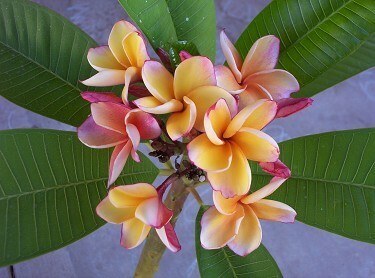 Plumerias are usually propagated by cutting and grafting. You may also start new plants by seed but only cuttings and grafted plants guarantees that the flower color will be the same as the parent plant. So if you want to maintain named varieties, grafting or cuttings is the way to go. We have provided you with some information below on how to start new cuttings. To PLANT BY CUTTING - It is best to plant in a clear plastic cup. It is good Idea to add holes for drainage, Then take a calloused cutting ,( Which is a cutting that has dried and been sealed off on the bottom), and dip the cutting in rooting hormone. Lightly tap the excess rooting hormone off the cutting. Then stick your cutting down into the cup after adding some FRESH, moist cactus soil to the bottom of the cup. Then continue to fill the cup with soil to almost the top of the cup and press the soil down and around the cutting very tightly. Note: only 3 to 4 inches of the cutting should be stuck into the soil. Lightly water the soil around the freshly planted cutting and then set it aside in a warm sunny spot to root. Do not add additional water to the soil or the cutting will rot. The exception to the rule is to add water only if the soil has completely dried out, this is most likely to occur in the warm summer months. The moisture in the fresh cactus soil may cause some condensation to form within the plastic cup, which is helpful in retaining soil moisture. For larger cuttings, you can plant them in a larger black garden pot the same way, but only the clear cups will allow you to see the roots forming. This photo on the right shows the new main roots forming. Using the clear cups lets you see what is happening below the soil line. The reason you should leave them alone while rooting is, if you sneak a peek at the roots by lifting the cutting, or pull it out to check for rot or softness - you break off all these tiny first roots. Then when you see all is well and re-plant, you've broken the newly formed roots - and now have to start all over again. We have been experimenting with the Bag Rooting Method this involves planting calloused rooted cuttings in bags in moist coir bark and perlite. The cuttings are then placed on a heat mat to speed the rooting process this method has been highly effective in harder to root cuttings. Another method that has shown promising good results is the Egg Rooting Method, which uses the same planting techniques stated above and adds the additional step of placing a raw uncracked egg in the pot approximately 1" below the bottom on the end of the cutting. 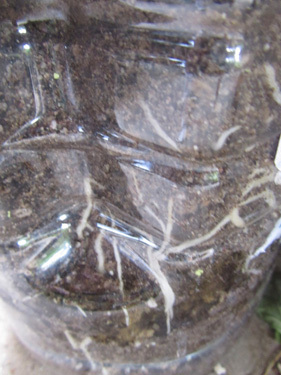 We have found this method helps increase early root development of freshly planted cuttings. This is due to the nutrients that are released from the fermenting egg. The Egg Method is based on the anaerobically fermenting process of eggs and probiotics, which benefits plants tremendously. It has been used in agriculture production for many years. Plants need an equilibrium of growth stimulants and plant hormones, to perform their best in regards to growth, flowering and crop production. The plumerias we have propagated using this method have developed a strong root structure and even flowered while rooting. This means that you can leave the inflorescences on the new cuttings without harming the rooting process. Pictured at the right is a cutting of Plumeria rubra. "King Kalakua" rooted by the egg method in approximately 6 WEEKS!! This plant even bloomed during the rooting process!! The Science behind the "Egg Method" Explained. The egg method which is based on anaerobically fermenting eggs and probiotics that not only benefit plumeria cuttings and plumeria plants but many other tropical plants as well, including bananas, gingers, heliconias, hibiscus and many more. The egg itself contains many benefical nutrients. The egg shell which contains approximately 9000 pores acts as a permeable membrane for the slow release of nutrients and moisture. 95% of the egg shell is made up of calcium carbonate. Minerals, such as calcium phosphate and magnesium carbonate, make up the remaining 5%. The albumen is made up of 90% water and seven major proteins as stated by the Department of Agriculture's National Nutrient Database. The albumen in fresh eggs contains carbon dioxide which passes through the egg shell as the egg ages. 50 mg of Sulfur is contained in the albumen. Almost all vitamins found in an egg are contained in the egg yolk, this includesg several B-vitamins as well as vitamin A, D, and E. The egg yolk also contains many antioxidants and trace amounts of Iron, Magnesium, Phosphorus and other metals. In addition, the egg yolk contains about 25 mg of Sulfur. According to scientific research by Biofeed Probiotics, plant stimulants and plant hormones are produced during the metabolism of some bacteria, yeasts, molds, and cyanobacteria, also known as blue-green algae and blue-green bacteria. These plant stimulants and plant hormones include, auxins, gibberellins, cytokinins, florigen and salicylic acid. Auxins are named after the greek word "auxein" meaning to grow or to increase. Auxins were the first of the major plant hormones to be discovered. How auxins are distributed within plants is one major factor for plant growth. The distribution of auxins throughout plants is accomplished by the well executed transport of auxin molecules. Auxins usually work with or against other plant hormones that is most advantageous for the plant. Gibberellins were first discovered by Eiichi Kurosawa, a Japanese scientist, in 1926. Gibberellins stimulate, budding, cell division, cell elogation, dormancy, flowering and seed germination. Cytokinins promote cell division in plant roots and shoots. This process of cell division is called "cytokinesis". The effects of cytokinins were first discovered by Swedish born plant physiologist Folke Skoog at the University of Wisconsin at Madison. Cytokinins are involved in many plant processes, these include; cell division, root and shoot development. Cytokinins are known to regulate axillary bud growth, lateral or side shoots. In addition, cytokinins also affect apical dominance which is the inhibition of growth of lateral buds, side shoots, by the terminal bud of a plant shoot. Cytokinins are usually produced within the roots, young fruits and seeds. The balance of cytokinins and auxins determines what regenerates. Florigen was first described in 1937 by Mikhail Chailakhyan, a Russian scientist. Florigen molecules, are produced within the leaves of a plant and they are responsible for controlling flower production. Salicylic acid, which encourages root formation is found in a naturally occuring form within the egg yolk. It is similiar in nature to the main active ingredient found in most commerial roooting hormones. Salicylic acid derives its name from the Latin word "salix" meaning "willow tree". Salicylic acid also plays a vital role in photosynthesis, transpiration and resistance to pathogens which are bacteria, viruses, or other microorganisms that can cause diseases. Since all these plant stimulants and plant hormones are contained within a egg, using the "egg method" is a excellent way to provide a slow release of vital nutrients to a plant during the rooting process. While there is not an exact scientific process clearly written that is defined as the "egg method", we have obsevered beneficial results from applying this method. Note: Some of the information on plant hormones and their benefits to plants was obtain from the follow site http://www.plant-hormones.info/ The information was obtain under the principles of public domain and Creative Commons licensing and is presented for informational purposes only. Plumerias have no significant bug problems in Arizona. However, they can get black tip rot when emerging from dormancy in the spring. Black tip turns all of the growing tips black and also creates associated pockets of black liquid. This can kill the plant if left to persist for a long time. However, it does result in the plant branching, so if it's quickly cured it can actually have benefits. In Phoenix, putting the plumeria in full sun cleans up black tip in a couple of weeks or less. Full sun might not be an option in the middle of summer (see heat tolerance above). Black tip is a fungus so the sun simply dries it out. In humid climates this technique might not be as effective, so fungicides might be necessary. Greenhouse white flies can be a problem with plumerias kept indoors. The type of white fly that comes out in swarms in July in Phoenix appears to not bother plumerias at all. I believe this is the citrus white fly. However, the green house variety will multiply like crazy on your plant. The greenhouse variety does not live in AZ but if you're unlucky you'll get it when you mail order a plant from somewhere more tropical, like I did. White flies are resistant to every pesticide known to man and are therefore almost impossible to kill. The solution? Cut off all of your plants leaves, put them in a plastic bag and soak them with pesticide and throw them in the trash. A healthy plumeria will survive this but might decide to go dormant for a while before popping out leaves just to make you worry.